The Killers haven’t released a new studio album in five years (they’ve finally got a new one due out before year’s end), but the band showed no signs of rust as it played to a huge crowd at Day Two of Lollapalooza. “I can’t believe this many people know the Killers are still around,” said one fan as she gazed out upon the masses gathered at Grant Park to hear the group headline the festival. Opening with “The Man,” the band rambled through a fast-paced set that included hits such as “Somebody Told Me” and “When You Were Young.” Wearing an embroidered sport coat, singer frontman Brandon Flowers was a real showman as he regularly hopped atop the speaker monitors to dramatically gesture while delivering the band’s distinctive ’80s-inspired rock ’n’ roll. A dazzling light show helped bring the vibrant songs to life. Singer-pianist Andrew McMahon wins the award for delivering the best feel-good performance of the day. At his set’s start, McMahon sauntered onto the stage with his band In the Wilderness and then sat at the piano to deliver the poppy “Fire Escape.” He concluded the tune by jumping on the piano’s keyboard, his signature move. His vocals sounded particularly sharp on the a cappella intro to “Walking in My Sleep,” and near the end of the set, he would venture off the stage and crawl into an inflatable raft held up by fans. He enthusiastically thanked the Chicago fans for supporting him for the past 15 years he’s spent coming to the city as a recording artist and spoke about the way music enables people to leave their troubles at the door. It’s hard to dislike a guy that exudes that much positivity. The guys in the hip-hop group Run the Jewels also spent some of their set encouraging fans to love and respect one another even if “those motherfuckers” in politics can’t abide by those principles. The band’s rappers — Killer Mike and El-P — arrived on stage to the sound of Queen’s “We Are the Champions” blaring on the PA system. The stirring “Nobody Speak” utilized some deft turntable scratches, and the band dedicated one song to Linkin Park’s Chester Bennington, the singer who killed himself earlier this year. El-P told the audience that suicide could and should be prevented. The New York-based indie electronic duo Phantogram also turned in a thrilling performance. With the assistance of a live drummer, the two emphasized the aggressive side of songs such as “You Don’t Get Me High” and “Same Old Blues.” Singer-guitarist Josh Carter and singer Sarah Barthel made the most of performing on the large stage and regularly faced off against one another during their high-energy performance. Cloud Nothings, a group of twentysomethings who look like they all work at a hipster coffee shop played a rousing mid-afternoon set that included songs such as “Modern Act,” a tune that Jayson Gerycz propelled with his heavy drumming. The group’s set careened at a quick pace but hit a little bit of a wall as the band played the set closing “Wasted Days,” a tune which found singer-guitarist Dylan Baldi screaming into the microphone during a meandering jam. The blues band Kaleo also fared well as singer-guitarist JJ Julius Son endeared the group to the crowd by wearing a Blackhawks jersey. His soulful voice and mid-tempo ballads resonated with the large crowd that assembled to hear his band’s mid-afternoon set. The Swedish electronic group Little Dragon also deserves a mention if only for employing some great visuals. 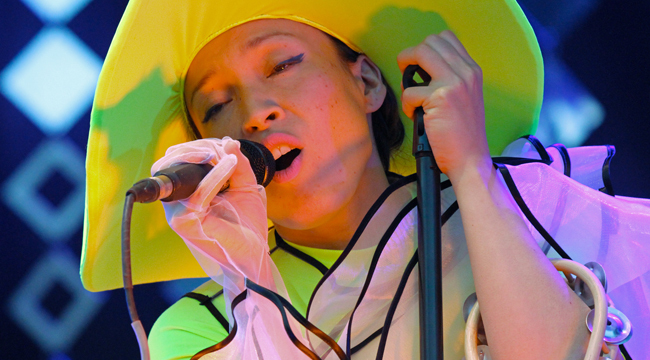 As much a performance artist as a musician, singer Yukimi Nagano wore a neon dress that literally glowed (it was illuminated from within) and twirled evocatively as she sang. While thunderstorms derailed Day One, the threat of rain never fully materialized on Day Two and the cool temps that stayed in the low 60s created the perfect climate for the outdoor festival. To see more photos from Friday, click here.